THE BRAND OF THIS BIKE IS 'HONEST CHARLEY', BUT TILTED AS A 2003 HONDA BECAUSE THEY GO BY THE FRAME. 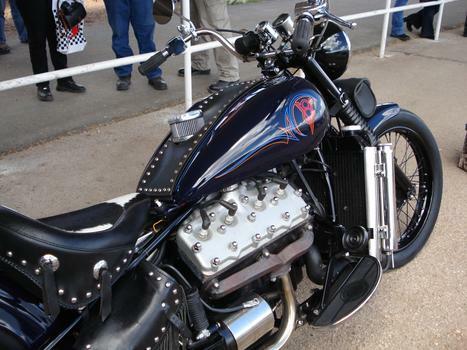 MINE HAD A 1937 FORD V8-60 IN A 2003 HONDA C750 FRAME. THE V8-60 LIGHTWEIGHT FORD FLATHEAD ENGINES WERE EXTREMELY POPULAR IN THE MIDGET RACING SCENE. MY BIKE WAS MANUFACTURE #17, AND BUDDY OF MINE OUT OF ALBUQUERQUE, NM. HAS #18. I HAVE BEEN TOLD THAT JAY LENO HAS TWO OF THESE HONEST CHARLEY'S, #19 AND #20, BUT DON'T KNOW IT FOR CERTAIN. I PUT THIS IN AMERICAN TORQUE BECAUSE ALLOT OF GUYS SEEMED INTERESTED IN SEEING WHAT IT LOOKED LIKE. ANYWAY, I LOVE THE OLD FORD FLATHEAD ENGINES AND WHEN I SAW THIS I JUST HAD TO HAVE ONE. SO, I SOLD A BUNCH OF STUFF TO COME UP WITH THE MONEY, AND I NEVER WAS SORRY. IN BACK OF THE ENGINE WAS THE ORIGINAL OLD FORD TRANSMISSION, BUT IT WAS 'SHORTENED' BECAUSE IT ONLY HAD 'HIGH GEAR', AND WAS 'LOCKED' IN THAT. YOU HELD THE CLUTCH IN TO START IT, AND THEN YOU WOULD 'FEATHER IT' TO GET IT OFF THE LINE. IT WAS KINDA SLOW UP TO ABOUT 30, THEN IT'D 'GIN'. GETTING THIS LIGHT BIKE MOVING IN HIGH GEAR WAS EASIER ON THE CLUTCH THAN GETTING AN OLD 'ALL IRON' CAR MOVING IN FIRST GEAR. OTHER THAN BEING AN ORIGINAL FORD FLATHEAD, IT HAD BEEN COMPLETELY OVERHAULED WITH WHATEVER YOU PUT IN 'EM SO YOU CAN USE REGULAR GAS WITHOUT HAVING TO PUT IN 'LEAD ADDITIVE', PLUS IT WAS CONVERTED TO 12 VOLT, AND HAD ELECTRONIC IGNITION. 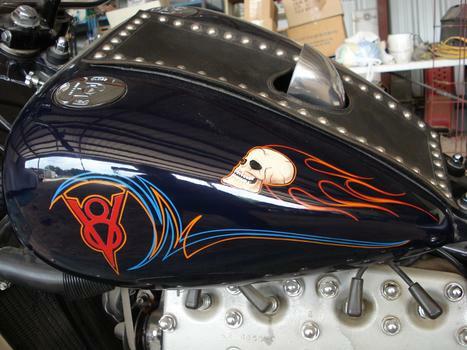 IT WAS 'PLAIN JANE' BUT WITH THE SADDLE BAGS WHEN I BOUGHT HER, THEN I HAD STEVE KAFKA PINSTRIPE HER, PUT THE SKULLS ON HER, ETC. IT NEVER GAVE ME EVEN A MINUTES WORTH OF TROUBLE. AND IT'S A DANG GOOD THING, BECAUSE I AM ANYTHING BUT MECHANICALLY INCLINED. I GOT IT UP OVER 110 ONE TIME WITHOUT REALIZING IT, BUT THEN SHUT HER DOWN, REAL FAST. 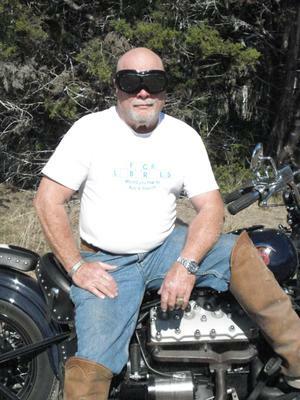 THIS BIKE ISN'T A 'CRUISER', IN FACT THE LONGEST TRIP I EVER WENT ON IT WAS TO THE NEXT TOWN OF BANDERA, TEXAS, ABOUT 22 MILES AWAY, BECAUSE LIKE ALL OLD FORD FLATHEADS 'THEY HEAT UP', AND THIS ONE WAS NO DIFFERENT, ESPECIALLY IN THE TEXAS SUMMERS. I HEAT UP ALSO. I IMAGINE IT WOULD HAVE TAKEN A HELLOVA WIDE RADIATOR TO KEEP THIS RASCAL COOL, DOWN HERE IN TEXAS, ANYWAY. LUCKILY THE GUY WHO BOUGHT IT WAS FROM INDIANA. 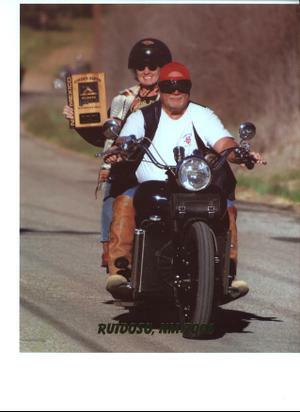 IT WON PRIZES AT EVERY BIKE SHOW I EVER ENTERED IT IN, AND MOST I DIDN'T, ION ORDER TO GIVE OTHERS A CHANCE TO WIN A TROPHY. 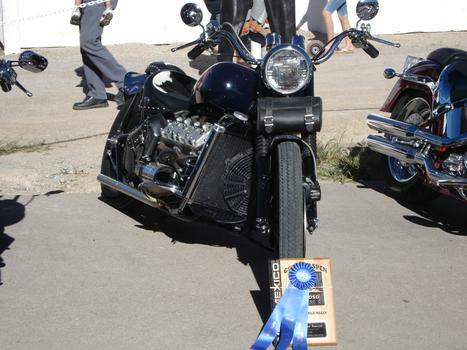 IT WON 'MOST UNUSUAL' CLASS AT THE GOLDEN ASPEN BIKE RALLY IN RUIDOSO, NM. 4 YEARS IN A ROW, THEN I STOPPED ENTERING IT. NO MATTER WHERE I WENT AND STOPPED, THERE WERE OLE PHARTS LIKE ME LOOKING IT ALL OVER, EVEN CRAWLING AROUND ON THE GROUND TO SEE UNDER IT BETTER. I SURE MISS HER. SHE WAS THE MOST FUN VEHICLE I'VE EVER OWNED. 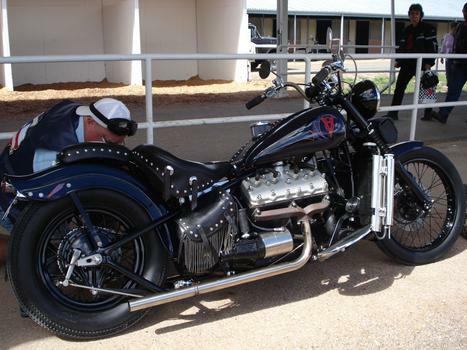 FOR YOUR INFORMATON, THE GENTLEMAN WHO BUILDS THESE FOR 'COKER TIRE' (WHO SELLS THEM) HAD A 1937 LINCOLN ZEPHYR V12 IN HIS BIKE AND SAID IT WAS 'AWESOME'. FOR MORE INFO ON THEM, YOU CAN LOOK UP HONEST CHARLEY ON THE WEB. THANKS TO ALL VETERANS, PRESENT AND PAST, FOR YOUR TERRIFIC SERVICE OF KEEPING AMERICA SAFE, AND ALLOWING US TO ENJOY OUR LITTLE HOBBIES. OMG...I would love to hear that tiger roar !!! OlePhart: I spent some time on Honest Charley's site and it brought back some fond "MOON" memories. I didn't see a list price for one of those FlatHead bikes. Do you know what they go for? If I remember correctly, the last time I priced a new one they were I believe $34K, but this was about three years ago. I just imagine they've gone up some since then, but possibly not. I was extremely fortunate to find a 'used gal' with only 7 miles on her. I believe she only had 1,250 miles on it when I sold her in '09. That's about what I figured on the price...Oh well, something to dream about !!! I am building my own. Please tell me what the wheel spacing is.